Lumps and Bumps in Bulldog: Are They Harmless? About a month ago, we noticed this hard grisly lump on her left hip, no hair missing – you can touch it, move it etc, she lays on it, runs, go for walks and does not seem to bother her. It’s not a large lump but if you like cup your hand – it’s about that size. You can’t see it the actually lump – you can only see that there is a lump there. We have another vet appt coming this Mon, but I was wondering if you could give me some insight about this lump – you have helped me so much in the past, I thought you could guide me to do something different or anything at this point – we are getting real scared. She is fine, fat and sassy just that lump. We know it’s not normal. There are different kinds of lumps and bumps on dogs. You did the right thing taking Bridgette to the vet to have it checked out. Most often these lumps are benign fatty tumors known as lipomas and don’t need to be removed. No one knows why dogs get them but they are usually squishy. Some suspect they are caused by food allergies. Another possibility from what you describe is a cyst. Your vet did a biopsy of the tumor to find out what kind it is. Clear usually means harmless and the second biopsy could have been affected by the first and hence the blood cells. He sent the biopsy to the lab to make sure it was not cancer and thankfully it was not. He prescribed the antibiotic in case it gets infected. It sounds like you’re in good hands with your vet who’s keeping an eye on this growth. Let me know how Bridgette’s doing and what the vet says in his follow up. I am on my second bully now, a wonderful ever so chewhappy 6 mo wonder. The first one (love of my life for 9 years) I had to put down since he was losing his battle with lupus. My question to you is, have you ever heard of a bully getting lupus? I’m sorry to hear about your Bulldog but glad to hear you have a new Bulldog puppy! which often go undiagnosed. Collies are the dogs most affected by Lupus Erythematosus. It is not a very common disease in dogs. most common manifestations of this is skin allergies. This Christmas, Matilda’s getting skateboarding lessons, a £150 cashmere blanket, a head massage and tea at a five-star hotel. Not bad for a two-year-old bulldog! On Christmas day this year, just like the past two, I’ll be showering the love of my life with sumptuous gifts, endless cuddles and love. We’ll sit beside the tree together, carols playing in the background, and open our presents, oblivious to the world around us. Sadly, for my partner of four years, George, I’m not referring to him but to our gorgeous two-and-a-half-year-old bulldog Matilda. You’d be forgiven for thinking I’m barking mad – pardon the pun – and I probably am, but Matilda came into my life and changed everything, not least my capacity to love another being. Christmas is an opportunity to show her how much she means to me, to the tune of gifts costing more than £600 this year. Poor George will have to take his place on the sidelines, no doubt feeling very left out as he unwraps the meagre £100 worth of gifts I’ve bought for him. All my adult life I’ve been very vocal about not wanting children. I’ve always been an ambitious career girl, appearing in TV programmes, taking part in documentaries and presenting The Late Show on BBC London. I’ve long enjoyed a fabulous social life, with invitations to the best parties and restaurant meals every night with George; the only thing that had graced the inside of my oven until recently was a cashmere Nicole Farhi coat that I keep in there to stop the moths from getting it. I always believed there was no place for a child in my life, and that if I did have one, I’d be a terrible mother, the kind who’d forgetfully leave it standing outside the supermarket while I drove off, oblivious, with the weekly shop. So it was one of life’s greatest surprises when, three years ago, I found myself in the throes of an urge I’d never experienced before; I wanted something to care for and nurture. It all started when George, a musician and broadcaster whom I’d been dating for a year, came with me on a trip to New York. When we went for a walk in Central Park, there seemed to be bulldogs everywhere. They looked like fat, cuddly children who were docile and didn’t want to do a lot except be loved. I couldn’t take my eyes off them. The strange thing is I’d never been an animal lover either. When I was in the soap opera Crossroads in the Eighties, I bought a border collie as a status symbol, but I was an appalling dog owner then. But bulldogs can suffer awful health problems, so George, who was already an animal lover, did lots of research for a good breed. In August 2008, we drove to Hertford to pick up our new bulldog puppy, Matilda. She was tiny and vulnerable and I cradled her in a blanket in the car. We both remarked that it really was like bringing home a newborn baby. George taught me how to feed and care for a puppy and, in doing so, helped create a monster. Matilda became the centre of my world and comes before George every time, never more so than at Christmas. Apparently, I’m not alone in my doggy madness. 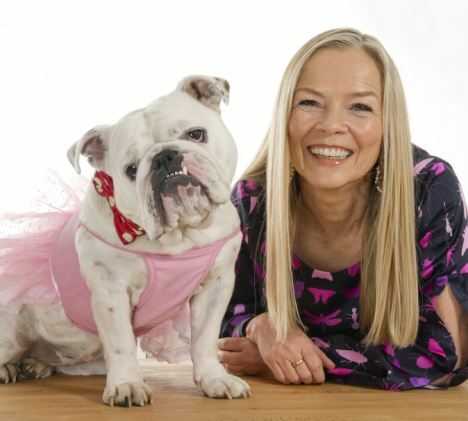 According to the Oxford Dictionary, what Matilda has become is my ‘furkid’ – a word used to describe the increasingly common phenomenon of dogs taking on the role of surrogate children, particularly among childfree women in their 40s and 50s. Research has revealed that women produce oxytocin when they stroke their own dog – the same happy hormone produced by new mums when they breastfeed their babies. And we lavish more than £5 billion every year on our dogs in the UK alone. I’m not embarrassed to admit I fret over Matilda every bit as much as if she was a child. When she had her second lot of immunisations at 12 weeks old, I could finally take her out for her first walk, and chose my close friend, comedian Julian Clary, and his dog as our companions. We walked, had coffee and walked some more before I noticed Matilda had bubbles coming out of her mouth. I was terrified she was ill, so we jumped in a cab and made what would be the first of many dashes to the emergency vet, who told me I’d over-walked her and she’d have to stay with him overnight. I sobbed all night and suddenly understood how parents must fret over their babies. George despairs of the constant unnecessary visits to the vet I make with Matilda, and he doesn’t even know about half of them. I’m so paranoid about her health and wellbeing that all her food is organic, made freshly and delivered to our door by a specialist company. She has steamed vegetables with her meals, organic biscuits as treats and drinks only bottled water. I spend more than £50 a week on Matilda’s food and health supplements. She also goes to a pet crèche when George and I are working, where they have a pianist who plays classical music. Then there’s her wardrobe. The first thing I bought her was a pink Aran sweater with matching plaited collar and lead at around £170. She has a collection of hoodie tops with her name on them, plus waterproof fleeces at £45 a time: some with legs, some without. All Matilda’s collars are handmade from a company called Holly & Lil, who supply Harrods. This Christmas, I shall be expanding her collection of luxury items. While all I’ve bought for poor George is a stripy shirt and a pair of bulldog cufflinks, I’ve got so much for Matilda. Mind you, that’s an improvement on last year when I didn’t buy George a thing. On Christmas morning, Matilda will unwrap – with a little help from me – a beautiful cashmere blanket (£150), handmade dog biscuits (£15), toys (£60), a solid silver identity tag (£25), a designer collar (£100), a new bed (£70), winter clothes including a tweed coat (£200), and a voucher for a one-tone training session to teach her how to skateboard (£25). Before Christmas, I’ll also treating her to afternoon tea at the dog-friendly, five-star Milestone Hotel Kensington, with her best friend Molly, a miniature bull terrier (£50). To make sure Matilda’s in good shape for the festivities, I’m taking her to a new doggy spa at Harrods this week for a cranial massage, her favourite pampering treatment. I know it must sound completely over the top and indulgent , but there’s a serious side to my relationship with Matilda, too. The bond between us was instant, and she’s had a positive effect on our whole family. My brother doesn’t have kids either, so she’s almost a surrogate grandchild for my mum. I often overhear Mum talking to Matilda in the kind affectionate voice usually reserved for children. Perhaps the most startling discovery, though, has been a maternal instinct I didn’t know existed within me. It’s too late for me to have children now and I don’t regret the decisions I’ve made. But having Matilda has made me realise if I’d had a baby, I would have been very affectionate, doting mother. What’s upsetting is that bulldogs only live for about eight years, when Matilda’s five, I’m going get another puppy to ease the grief of losing her when it happens. But I’m not going to think about that yet. After all, we’ve got a very special Christmas to look forward to, spending it together. Oh, and with George, too.